This "handbook" gives a full history and critique of three of the greatest clowns that ever put on a show for unregenerate mankind: philosophy (Col. 2:8), science (1 Tim. 6:20), and psychiatry (Rom. 1:28). These super clowns of man's depravity are the gods of the heathen that major in materialism and humanism. They magnify man and humanize God. They ignore Heaven and Hell and promise man a "Utopia" apart from God and the Bible. None of them believe or preach a new birth; they all lean to international socialism; and they all post "findings" that are completely irrational and irresponsible. 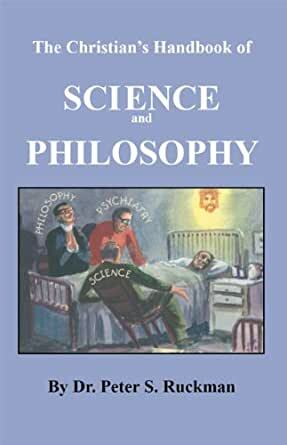 In this book, Dr. Ruckman discusses the four main views of philosophy and all the major philosophers, he presents the salient material on creation and evolution, and he gives an overview of psychiatry and its effectiveness. This work is excellent preparation for anyone in high school or College who is interested in God's view of the wisdom of this world. Incredible review of philosophy and what passes today as "science"
secular education as exposed in this book. Great job, Dr. Ruckman. Thanks for writing this one. Great resource by a true Spirit filled pastor and teacher. Ruckman is one of a kind! 5.0 out of 5 starsA Detailed Exposition on why the Wisdom of this World is truly "Foolishness with God"
I know it's cliche' to say, but I'm gonna say it anyway; "This book belongs in every Bible-believing Christian's library." I really mean that. Why? Because it is a one-of-a-kind read. And not only that, more importantly, it is the only Christian book that I'm aware of that truly sides with Scripture against the world's system in these specific areas of study and thought. This book exalts God's words, while putting-down the "gods" of men. You'll find no back-slapping for mankind here. Instead, all the LOVE in the book, is love for the truth - love for God's words and the authority and wisdom they impart (1Cor. 14:4-6). From a Christian perspective, it is the right position to take, and the author makes no apologies for it (James 4:4). The book is divided into three sections;  Philosophy (136 pgs),  Science (112 pgs) and  Psychiatry (68 pgs). Each section examines the subject in detail, along with it's history, stand-out personalities, and how fallen man uses such to subjugate or skirt the Authority of the Bible. It is a true study in "the wisdom of God" vs. "the wisdom of this world". Being also an accomplished artist, the book is peppered throughout with the author's humorous and cynical cartoons. I've actually had this book (paperback version) in my personal library for probably about 15 years. It is a CLASSIC in Christian literature and one that every sincere Bible student should read.